Midfielder Sam Foley intends to wait until the end of the season before resolving his Cobblers future. The 32-year-old midfielder is out of contract in the summer but he’s widely-regarded to have been among Northampton’s best performers this season having made 35 appearances in all competitions, including starting the last seven games in a row. I’ve enjoyed my football once I got into the team and stayed in the team and it’s nice to have a manager that trusts your game and trusts your personality. But with manager Keith Curle yet to give any indication on who he intends to keep once the season finishes, Foley is set to be a free agent in the summer, joining the likes of Daniel Powell, Shay Facey, David Buchanan and John-Joe O’Toole. When asked about his future after Saturday’s 2-2 draw at Notts County, Foley was keeping his cards close to his chest. “All you look at is the next game,” he said. “For me, getting into the game late after being in non-league, I’m just happy to be here. 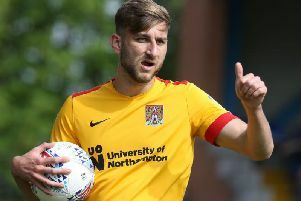 There can be no question that Foley has enjoyed a far better season this time around compared to his first campaign at the Cobblers, when he was in and out of the side under Jimmy Floyd Hasselbaink and made just 18 starts. Curle in particular seems a fan of the hard-working, hard-running central midfielder, who has been a regular starter this season, bar a spell in January and February when he struggled with a back injury. “It’s a question for the gaffer,” Foley added. “I’ve enjoyed my football once I got into the team and stayed in the team and it’s nice to have a manager that trusts your game and trusts your personality. “You know he can keep you in. Sometimes your form isn’t great and if you drop out the team, you know he still likes you and previously that probably wasn’t the case.